Video caption: Sepsis: What is it - and how to spot it?Sepsis: What is it - and how to spot it? A new rapid test for an earlier diagnosis of sepsis, which researchers say could save thousands of lives, has been welcomed by a woman from Cornwall whose 12-month-old son died from the condition. Diagnosing sepsis currently can be a complex process, but researchers from the University of Strathclyde have developed a device which analyses the patient's blood, and results can come through in two-and-a-half minutes. The researchers said they hoped the low-cost test could come into everyday use in three to five years. It is estimated that 52,000 people in the UK die every year from sepsis - a serious complication of an infection. The condition hit the headlines following the death of William Mead, who died in December 2014 after health professionals failed to recognise he had the condition. His mother, Melissa Mead (pictured), a campaigner to raise awareness of the condition, said anything enabling quicker access to sepsis treatment "is always welcome" but added that other factors had to be taken into consideration. Doctors and people need to think [more] about sepsis - you can't access the test unless somebody suspects you've got sepsis. Over 70% of sepsis cases start in the community rather than in hospital. Doctors need to be thinking sepsis so they can fast-track patients." A huge project to restore peatland across the region is already showing signs of success, according to South West Water. Government funding totalling £2m will help restore more than 1,500 hectares of damaged areas of Bodmin Moor, Dartmoor and Exmoor. It's hoped the project will encourage the return of birds currently in decline. Nile Rodgers and Chic are set to bring the "Good Times" to the Eden Project where they're due to perform this summer. The legendary hit-makers will take to the stage on Friday 21 June. It will be their second performance at the Cornish venue, having made their debut there in 2013. The gig is part of the Eden Sessions which has already seen Kylie Minogue and The Chemical Brothers confirmed for concerts there later this year. Tickets go on general sale on Tuesday 26 February. M5 Devon northbound severe disruption, at J29 for A3015 Honiton Road Exeter. M5 Devon - M5 lane closed on entry slip road northbound at J29, A3015 (Exeter), because of a lorry having a tyre changed. Traffic is coping well. A barn owl has gone missing from its home in Exmouth after it was attacked by a flock of seagulls last week, its owners say. Nic and Andy Gibson are pleading with members of the public to keep an eye out for four-year-old Gwedd. She was described as a female barn owl, with black spots on her white chest. She flies really slowly and has broad rounded wings, and will also have anklets and flying straps. Nic, who said she had been "in floods of tears since she went missing", said they were following up a couple of tip-offs of recent sightings. Sisters from Cornwall are taking action after being shocked by the amount of plastic from sanitary products that ends up in the sea. Ella and Lauren Turner - from Falmouth - say plastic from tampons and sanitary towels is a big contributor to plastic pollution. They say there's a simple solution - a reusable cup - inspired by a project in Zambia, and they're encouraging women to use one. This is probably one of the most simple changes anyone can make to reduce their plastic footprint. The menstrual cup is the most simple change. It's such an easy solution to so much plastic waste. Why are menstrual cups becoming more popular? Two seal pups which have been spotted on some rocks near Mousehole, one with some lacerations, have been taken to a sanctuary, a man who spotted them says. The pair were initially seen on Monday by photographer Simon Maycock. He said both were taken to the seal sanctuary at Gweek on Tuesday morning, including this one who he photographed before it was taken away. "The team from the British Divers Marine Life Rescue deserve huge credit for their fast response," he said. There is a growing campaign in Totnes to stop local Conservative MP Sarah Wollaston from being selected to stand in the next general election. BBC Radio Devon has seen a letter sent to her association chairman saying that 50 members have signed petitions to trigger a vote of no confidence in the former GP. Her critics said they were unhappy with Dr Wollaston's support for a second referendum and they believed she was trying to obstruct Brexit. Dr Wollaston has been approached for a comment. English Heritage says the donation for the footbridge at Tintagel Castle in Cornwall is an "inspiring gift". Police have confirmed the death of a Braunton man earlier this month is not being treated as suspicious. Officers issued an appeal after a 60-year-old man was found in the garden of a property in East Street with serious head injuries. 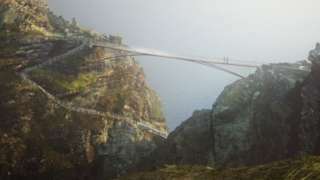 English Heritage has received a donation of more than £2m from a charitable fund towards building a controversial new bridge at Tintagel Castle, site bosses say. The Julia and Hans Rausing Trust is giving £2.5m to the project, with the bridge due to open this summer. The money represents half the total cost of improvements to the site, with planned works including the bridge due to cost more than £4m. The bridge plans have had criticism, with opponents saying it would adversely affect the site. English Heritage said the new bridge - connecting two sites at the castle - would fit into the landscape, "providing new views of the site's architecture, whilst improving access for many visitors". The settlement's divided landscapes were once united by a narrow strip of land. The charity added that the gift was the "largest single private donation ever received by English Heritage". The Julia and Hans Rausing Trust describes itself as a charitable fund "that supports organisations and charities across the globe". Engineers have reached a milestone in their progress as they drill for gothermal energy in Cornwall. Well, it's 3,000m down actually, which is about 1.8 miles according to our calculations. Two wells will be drilled 2.8 miles (4.5km) and 1.5 miles (2.5km) into granite at United Downs near Redruth where the temperature is up to 200C (390F). Cold water will be pumped down to the hot rocks and then brought as heated water to the surface. Steam from the heated water will drive turbines producing electricity, perhaps enough for 3,000 homes. Workers are continuing to chip away at Sidmouth's "monster" fatberg after removing more than 54,000 litres from a town sewer. As of Tuesday morning, South West Water (SWW) has loaded up four tankers' worth of the excavated fat, with each trip carrying up to 3,000 gallons, or 13,600 litres. The 64m-long 'berg was discovered in a sewer under the seaside town's esplanade just before Christmas. Work was due to begin clearing the congealed fat and wet wipes at the beginning of February but heavy rain raised the water level in the sewer, making it unsafe to start. Now, though, a SWW spokesman said the company was making good progress due to the recent spell of dry weather. Samples have also been sent to the University of Exeter for analysis. The entire removal operation will taken an estimated eight weeks to complete. Police in Penzance say they have been supporting an "elderly, vulnerable" fraud victim "after he fell victim to online scammers". Officers said on Facebook such "despicable" crimes were "generally targeted towards vulnerable or elderly people". They added: "It is important for everyone to be aware that if you receive any communication stating that you have won a large sum of money together with a request for you to send them money before your prize can be released, it will be a fraudster trying to rip you off." Any such offences should be reported to Action Fraud, officers said. A Devon MP has warned efforts to tackle the rough sleeping problem in his constituency are being hampered by a lack of council support. The PATH charity provides meals to hand out to people living on the streets of Torbay but it's being evicted from the council-owned property where it's based. Torbay Council says there are currently no suitable council-owned properties available but that it will continue to work with the charity to find them another home. A project exploring how best to harness geothermal energy in Cornwall has been awarded almost £2m. The funding from the Natural Environment Research Council, will help scientists from the British Geological Survey, Heriot-Watt University and the Camborne School of Mines investigate how best to harness geothermal energy in the county. The country's heat-producing granite rocks make it a good place to try and exploit geothermal energy, say engineers. At the end of last year, drilling began on the £18m United Downs scheme near Redruth, where engineers hope there could be enough resource to provide electricity for 3,000 homes. Construction has also already started to heat a section of the Jubilee Pool in Penzance using geothermal energy. A camper van has been damaged in a fire in Plymouth early on Tuesday morning. Fire crews were called to the scene on Plympton Hill just after 04:00. Police were also called to investigate the incident. The van was believed to have been deliberately ignited, Devon and Somerset Fire and Rescue Service said. A woman has "life-changing" leg injuries after being involved in a crash in Cornwall. Officers were called to the A388 outside of Camelot Kennels in Kelly Bray at about 19:00 on Monday. The 65-year-old woman - from Launceston - became trapped in the Smart car she was driving after it was involved in a collision with a delivery van. She was taken to Derriford Hospital where she remains. The driver of the van was unharmed. The road was closed for almost five hours while investigation work took place. Anyone with any information is asked to contact police via 101. Planned strikes by workers on South Western Railway in the dispute over guards on trains have been suspended. Rail, Maritime and Transport (RMT) union members were due to walk out on 22 February and on 9 and 16 March. The union said there had been a breakthrough in the row which has seen a series of strikes including over the Christmas and new year period. It follows the suspension of strikes on Northern Rail after the company agreed to guarantee a conductor on all trains. South Western Railway has services from London to Exeter, via Honiton and Salisbury.